Soybean aphids have been present on soybean at low levels (below the economic threshold of 250 aphids per plant) at various locations in the state for the last couple of weeks. Last week, WI DATCP Pest Bulletin reported that about one-third of the state’s soybean fields still had no detectable population. Their examination of 29 fields (V3-R1) from June 30 – July 6 found aphids in 19 (66%) of fields sampled in Dane, Lafayette, Fond du Lac, Jefferson, La Crosse, Rock, Sheboygan, Vernon and Winnebago Counties. Both my lab and David Hogg’s lab at UW Madison Entomology Dept. have found low densities at Arlington and West Madison agricultural research stations, respectively, in our research trials. Tom Novak, CCA, Total Crop Management, in Jefferson County has been finding in aphids in all soybean fields scouted this past week except late planted fields (last few days of May and early June) with Cruiser insecticide seed treatment. Together, the reports above have a few fields at 20-25 aphids/plant field average (with heavier plants in that average counts at 70 to 90 aphids on individual plants). Soybean aphid scouting should start now, if you have not yet checked fields for this insect for the first time this season. Heat units are accumulating more quickly now with warmer summer weather, good soybean growth conditions, and all soybean should be on a regular soybean aphid scouting schedule no later than R1 (beginning bloom). Start spot-checking vegetative soybean, then scout regularly from R1 (beginning bloom) through R5 (beginning seed) stages. Check 20-30 plants per field, from throughout the field, to obtain an average aphids/plant density for the field. 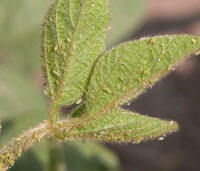 Soybean aphid can be found on growing points and young leaves of vegetative soybean plants. From late vegetative stages through bloom and pod development stages, soybean aphids can be found on all plant parts. Although most common on undersides of leaves, they also occur on stems, petioles and upper leaf surfaces. Use an economic threshold of 250 aphids/plant to support insecticide treatment decision and timing. This economic threshold should be based on an average of aphids over 20-30 plants sampled throughout the field. Regular field visits (weekly intervals) are required to determine if aphid populations are increasing, and how field populations are responding to suppressive factors such as natural enemies (predators and parasitoids, entomopathogenic fungi), and/or weather and temperature conditions.